You, Lord, are the Great Comforter, my refuge and my strength. You hold me in Your tender arms where I am always comforted when I need it most. Thank You for holding me and keeping me safe, protected and comforted, away from negative thoughts and external forces. Psalms 9:9 – The LORD is a stronghold for the oppressed, a stronghold in times of trouble. 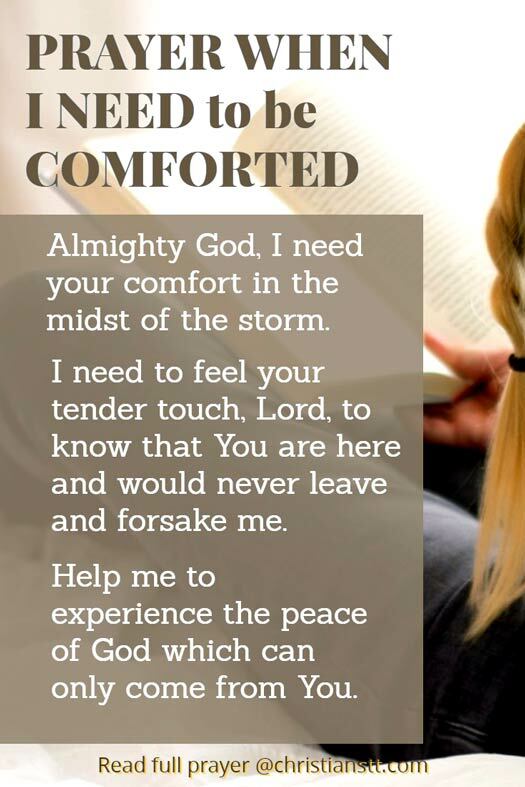 Almighty God, today I need to be comforted in the midst of my storm. I need to feel Your tender touch, Lord, to know that You are here and would never leave me nor forsake me. Holy Spirit, I pray that You would reveal Yourself so I would know that You are real. You were sent by our Lord and Savior, Jesus Christ to be our Comforter, our Intercessor and Standby. Show me, Father, how to seek Your face and look to You for wisdom and understanding. Help me to experience the Peace of God which can only come from You. Psalms 55:22 – Cast your burden on the LORD, and he will sustain you. He never permits the righteous to be moved. His Arms Hold the Universe, Let Him Hold You. Ephesians 1:12-14 – In Him also we have obtained an inheritance, being predestined according to the purpose of Him who works all things according to the counsel of His will, that we who first trusted in Christ should be to the praise of His glory. Thank You, Father God, for all that You continue to do in our lives. I thank you that we can call upon you at all times, whether in times of need, or simply to say, Thank You Abba for being our God, our Father, who guides us, feeds us and shields us from the kingdom of darkness. All praise be to You! Hallelujah to the King of Glory, King of Kings, Lord of Lords! Hallelujah to the Lamb, Jesus! In the name of Jesus Christ, thank You for Your everlasting mercies and blessings, SO BE IT…Amen and AMEN! Psalms 46:1 – God is our refuge and strength, a very present help in trouble. 1 Peter 5:6-7 – Humble yourselves therefore under the mighty hand of God, that he may exalt you in due time: Casting all your care upon him; for he careth for you. If this prayer has been a blessing in any way, please let us know. Leave a comment below. Give thanks and praise. How have you been comforted and blessed? Amen. Thank you Jesus. My peace and comfort comes from the Lord. Nothing I face is too much for me. God is with me. ???? It is well with my soul. Thru hardship, pain and suffering God is with you holding your hand. God promised to provide for all your needs, Trust and obey. May your faith grow stronger everyday. Thank you Jesus. AMEN. These prayers really strengthens me in my time of weakness. To God be the glory. I thank you dear Lord,for always being with me,even in the midst of my storm. Thank you Lord Jesus to bring peace in my heart and comfort me with Your love. Let me experience The Peace of God and feel Your tender touch. Both of that which can only come from You dear Father. Bless Jesus for dying on the cross.So that we may be saved. Father,I love You and I will do my best to please You,from this day forward. Thank You Lord,for blessed me with peace of mind,strengthens me and give me Your divine favor and mercy to start my day. Thank you God I give you all the praise and Glory. Thank so so much for your beautiful prayers I’m new Christ I’m thankful for your message each I looking forward to learning more thank you it’s helping me so much thank you ???? sending blessings and love to everyone most of all the the person who sit and share God’s word blessings to you. I need prayer to get through a difficult time in my life and make the right decisions. Holy Spirit I ask you to guide me and show me God’s will. My husband of just one year has become controlling, hypercritical of my appearance, is demanding that I do everything to make him happy, yet refuses to help me financially. What do I do with the emotional, verbal and financial abuse? I give it to you God and I surrender this marriage to you. I need prayers for my family and my marriage please. I am about to give up on my marriage as I have been trying to make it work for over 10years now. Also all my children are away from God. They have also turn against me. Won’t be a good Christmas this year. I am sick of my husband lack of caring about my feelings and emotions his lack of support in how I feel is chocking me. I feel bullied emotionally because i cannot say how I feel about anything for fear of being attacked and the anger and the sleeping in separate bedroom and that i have to constantly make the first move to talk to him first otherwise we don’t have a marriage. I’m sick of having to humble myself first to keep our marriage together. I feel worthless in his eyes as I am never worthy of an apology no matter what he has done wrong or how bad he has treated me.. I praise You my dear Heavenly Father.I need You dear God to bring me peace and comfort me in the midst of my storm. I thank you dear God,for You are always being here for me,never leave me and forsake me. Thank you Lord,for let me experience the Peace of God and feel Your tender touch. Both of that which can only come from You. I appreciate Christian TT prayers it helps to start my days with mighty God and comfort me at the end of day… Thank you…. God is good God is Great….? Gods Holy Spirit has truly been amazing.It comfort me when I wake up in the middle of the night and feeling lonley. Thank you Father almighty maker of heaven and earth that you would love me a sinner and send your only son to save me. Thank you for never leaving me or forsaking me. Thank you for you comfort and peace in this season of my life journey. Thank you for drawing me closer to you and putting girlfriends in God in my life to help me along this journey. You are so amazing Father. I love you, I adore you , I glorify you above all else. In Jesus mighty name Amen and Amen. I praise and give you thanks dear Father in Heaven,my dear Lord Jesus Chrish,for You are my comforter,my refuge,my strength,and my Prince Of Peace. Help me to experience the Peace of God,which can only come from You,dear God. I thank you for holding me and keeping me safe,protected and comforted away from negative touch. Thank you Lord,for always be with me,and comforted me in the midst of my storm. Thanks again for always here with me and never leave me,nor for sake me.Hallelujah..Amen. Lord hear my prayer in Jesus name.Amen.. Thank you for this prayer of comfort. It really comforts me I was oppressed. Thank you for this comforting prayer in my time of grief over the loss of my beloved grandmother. I thank God for the prayers,they are always on time. In God nothing is impossible.. Just Believe in Him and most of all have Faith In Him.. Nothing to be worry… Always talk to Him.. He hears our pleas.. He never forsake us.. Pray most of the time… ???? I praise and give thanks to You my dear Lord God Jesus Christ, You are my strength,my refuge,my strong tower. Thank you for always help me in my trouble times. Thank you fill me being comfort be in Your present. I need to feel Your tender touch and being comforted. Thank you Lord,for all that You continue to do in our lives. May the peace of God be with me always and forever. Glory be to Our Lord Jesus Christ.Hallelujah. You are welcomed, Lois. Pleased that this is a blessing to you.. Thank you Lord, I Glory your Name Christ Jesus. AMEN! I praise You Dear Heavenly Father.And thank you,hepl me to experience the peace of God which can only come from You.Thank you Father for Your Everlasting mercies and blessings. Amen. May God grant you peace and bless you always Dra.Lily. Father Lord, thank you for faithfulness, I worship your holy name and glorify you Papa. You’ve blessed me more than I deserve…Am patiently waiting on you God, have your way in my life. In Jesus mighty name. Thank you Bev Joy for this wonderful set of prayers, very much needed. Thank you Abba Father for being my everlasting Comforter. To God be the Glory. Thank you Bev Joy for this wonderful prayer. Thank you Abba Father for being my everlasting Comforter. To God be the Glory!!! Thank you so much for this heartfelt prayer Bevjoy. I believe some problems are not for us to solve but to give to our Lord. All we have to do is remember to cast all our Burdens on Him and He will take care of them for us. Do not just give some of your troubles to Him please give them all. Trust in Him for their is nothing impossible for our Almighty Father. From the rising of the sun until the going down of the same, You are so worthy,so worthy to be praised. You Lord God are the Great Protector, Guide, Healer, Counselor and Comforter and it is in You that I place my hope. I ask You Father for Your ever present light which will shine ahead of me on my new journey. In Jesus name I ask this. Amen. Father, Abba, I thank you O Lord, for the abundant Blessings, Peace and comfort you bestow upon me and my family amidst trials. Father,You are an Awesome God! You are my refuge, my fortress, my strength and my Redeemer. I will always Praise and Worship you, because I know You will never Forsake me. Amen and Amen! Thank you so much for this prayer today, it is just what I am feeling and what I needed at this tragic time in my life. I will trust God for his protection and provision with my whole heart. You are welcomed, Evelyn. 🙂 It’s just in time to give you comfort. Thank you Lord for the comfort and peace you bring into my life every time I need you Lord! Thank yOU Lord for your Blessings And comfort everyday. Thank you. God is working through a list for me. I am gradually getting out of the pit my family put me in.Work that lasts,finances ,family alienation resolved with my children,a safe vehicle to drive,a home I don’t have to move 46 times from,and finally( to find a Christian Husband on fire for the Lord) this last one is not there yet but have faith in God it will be. Yesterday was difficult I have had to forgive my brother and sisters more than 70×7 but I continue to do so. Keep praying Restoration for me . Thank you. Thank you Bevjoy for this awesome prayer. I really needed this. God bless you! Thank you for being my refuge & very present help in time of trouble, I give Glory and honor to your precious name. Please comfort me in the midst of my storm. Amen & Amen!